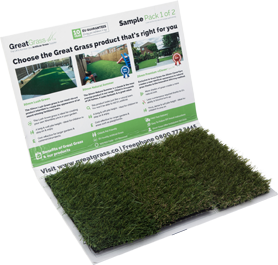 Order your samples today and you will receive 2 sample packs containing our entire range completely free of charge sent by first class post. Here at Great Grass, we’re all for convenience. No matter what it is you’re doing, it’s always easier if it’s done in an easy, efficient and simple way, but even better if you don’t have to do it that often at all! It should come as no surprise then, that we’re as happy as our customers when it comes to how low maintenance our artificial lawns can be, and happier still that we’re able to supply you with a high quality product guaranteed to cut down on the time consuming work often needed with natural grass. Whilst our product isn’t completely maintenance free, the huge increase in convenience simply can’t be ignored. In fact, many people underestimate just how low maintenance an artificial grass lawn can be, but the benefits are clear to see; you only have to experience it for yourself! Just a once over every two or three weeks with a brush or hoover is all you need to remove any build-up of fluff and naturally occurring moss, with the arduous task of mowing the lawn no longer necessary as our product does not grow organically. We couldn’t blame you for thinking it would, of course, as we’ve gone to every length to ensure that it’s almost unmistakable from the real thing! Pets will love it too, and especially if you’re a dog owner you’ll be rejoicing at the lack of mud which typically makes a mess of both your garden and carefully cleaned house. So why not invest in what we have to offer? As one of the largest artificial grass suppliers in the UK with a well-established reputation for quality in everything we do, making Great Grass your first choice is definitely a wise decision. We’ll work to meet your every need and requirement as an individual customer, ensuring you’ll be getting a perfect fit every time, and our products are manufactured to the highest standards of quality to really guarantee you won’t be disappointed by what you get! If you think that our services could be perfect for you, don’t hesitate to get in contact either by picking up the phone or dropping us an email. Don’t worry about choosing which types of grass to choose. we’ll send you them all to let you choose. We understand that renovating your garden can cost. We provide 0% finance in order for you to be able to spread the cost.